Cruise travel is not complete without proper transportation to and from cruise ports. If you are cruising to or from one of the European cities, make it easy on yourself and plan your smooth, convenient and private cruise transfer with a trustworthy limousine service. 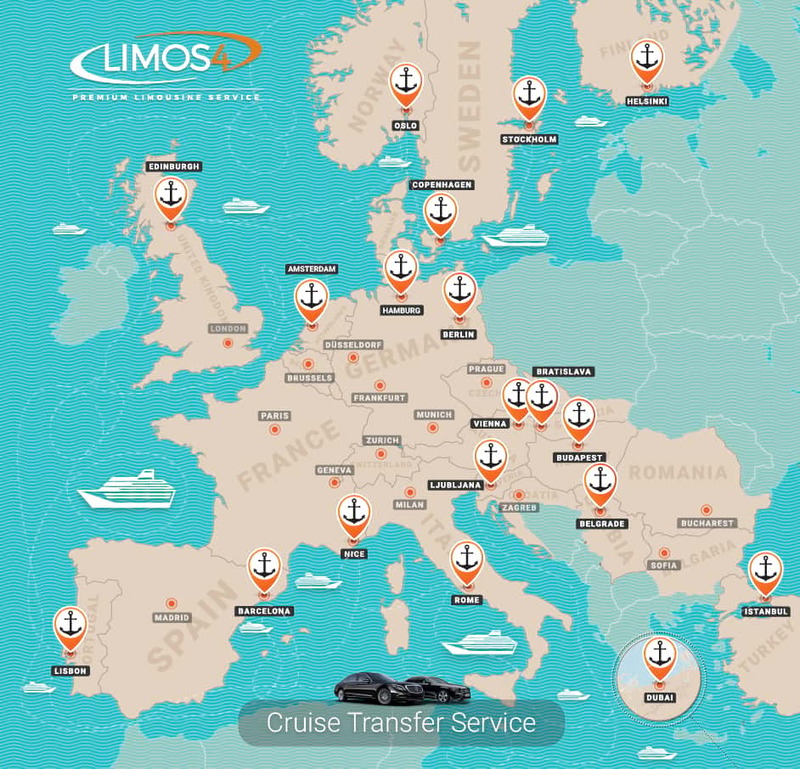 Limos4 is pleased to serve as many as 18 cruise cities throughout Europe. Our cruise transfer service includes meet-and-greet service – our chauffeur will wait for you at the terminal holding a personalized name board, assist you with your luggage and lead you to your car. What better way to start or end your dream vacation than with a comfortable and stylish ride in one of our fully equipped, top-class limousines. Just let us know the name of your cruise ship, your date and time of arrival and we will make the transportation arrangement for you to ensure your cruise experience remains a memorable one for years to come. To book your transfer to and/or from a cruise port terminal, fill out our price inquiry form and follow the procedure or contact us via email or telephone.